In order to understand what it means to be human, we have to go back to the beginning of human history. Even though the world tries to convince us that man is merely a mechanistic organism that is the result of billions of years of evolutionary change, the reality is that man was designed in the mind of God and created by the Word and will of God. In Genesis 1 we find these words. After God had spoken the rest of creation into being, He declared that the final act of creation would be the creation of man in the image of God. This makes man the crown jewel of God’s creation. He is uniquely designed and is the only being that has God’s image stamped on it. Even though most Christians have heard and would agree that every person is an image bearer of God, many have not given a lot of thought to the significance of this reality. What does it mean to be created in the image of God? When God makes man, He breaks the pattern that He has set by creating living things according to their kinds. The tenfold mention of this pattern causes us to expect it with each new living creature to appear, but something quite different happens when man is made; he is not made “according to [his] kind.” Neither is man created according to any other kind among the living creatures. Man does not, therefore, belong to their kinds, whatever similarities there may be between him and the other creatures. To put it in modern scientific language, he is not a particular species within a given genus of living creatures. Man is unlike any of the other living creatures (v. 26). Surprising as it is, man is made according to God’s “kind,” made in the image of God (imago Dei). Man, like God, is a personal being. Some people would argue that when man sinned, he lost the image of God. Even though God’s image in man was marred or disfigured by sin, it was not lost. This is a very important truth if we are going to be able to understand who we are and what gives every man and woman intrinsic value and inherent worth. Focus on the Family explains it this way in a Q&A reference on their website. …it is precisely the Image of God that makes man human; man could not lose the Image without ceasing to be what he is. Furthermore, it is only because he retains it, even in a broken or distorted form, that man is redeemable and worth redeeming. Over the next several weeks, I will present a series of short posts that will help us understand the significance of the words in Genesis 1 – in the image of God He created him; male and female He created them. In the meantime here are some questions that will be helpful in understanding what it means to be human. How well does your life reflect a “graphic image” of God? How does being made according to “God’s kind” define who you are and why you are here? How has sin marred God’s image in you? 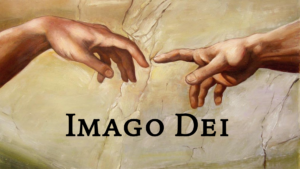 How does the reality of Imago Dei address today’s cultural issues of abortion, euthanasia, gender confusion and marriage? Looking forward to future reads. Interesting post. I was reminded of God’s grace in this statement: Even though God’s image in man was marred or disfigured by sin, it was not lost. This is a very important truth if we are going to be able to understand who we are and what gives every man and woman intrinsic value and inherent worth.